This year at Dreamforce, the entire Salesforce Ohana will get an opportunity to witness the convergence of data and analytics! As data is the new oil in the business; keeping a track of your business data and getting useful insights out of it will not only help you offer better customer service but also increase your top line. This year, we are heading to Dreamforce with a mission to showcase the power of Big Objects and how DataArchiva is leveraging it to support Salesforce customers. 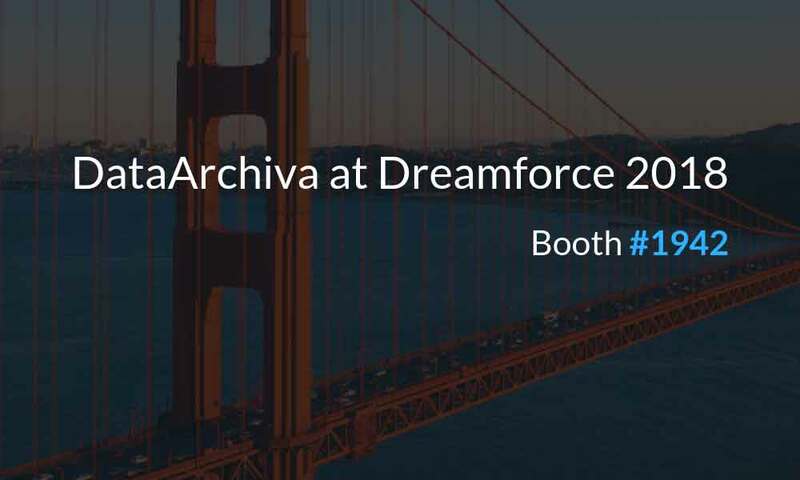 At Dreamforce, you will get an opportunity to see DataArchiva in action at booth #1942. DataArchiva was developed by CEPTES Software and powered by Salesforce Platform. It was launched in the AppExchange few months back and within no time DataArchiva grabbed eyeballs. As a Salesforce native data archiving solution which periodically archives unused Salesforce data, DataArchiva saves more than 80% of data storage cost. Recently been listed in the Gartner Market Guide, DataArchiva is designed to work with US Government Cloud, Einstein, Lightning and compliant with GDPR. By 2020, the volume of archivable data is predicted to be tripled and enterprises have to spend a huge amount to store their business data. In today’s data-driven business, it has become a necessity to have a data archiving solution in place to take care of your sensitive business data. As in Salesforce, there are various data growth sources, like health cloud, marketing cloud, sales cloud, service cloud, emails, activities, live agent, pardot, events, chatter, communities, and many more, DataArchiva offers a hassle-free data archival and retrieval process by taking care of your data storage concerns. Other than saving 80%+ data storage cost, DataArchiva offers a gamut of business benefits to the users. Few of them are; compliance & governance, lower risk of regulatory violation, alignment with Salesforce platform, templatized archiving as per industry, smart metadata reconciliation, scheduled archiving, performance enhancement, prediction & analytics on archived data, easy search & restore and much more. As DataArchiva is 100% native, your data won’t go out of your Salesforce Org and your data will be as secured as it was before. This application is highly recommended for healthcare, BFSI, Government, manufacturing industries as they deal with huge amount of data which needs to be retained for future use and also for compliance reasons. DataArchiva will be present at Dreamforce’18, booth #1942 in the customer success expo, Moscone Center. We are going to showcase short demos of DataArchiva every day at our booth. If you want to have personalized demo, please get in touch today. We know schedules are busy, but if you are looking to reduce your Salesforce data storage cost, you must visit us to learn more. You can get up to *40% OFF on DataArchiva and also some cool goodies along with a chance to win a special prize. You can take part in “DF’18 Wheel of Fortune” contest and win amazing prizes by spinning your wheel of fortune.